Egyptian men grew beards all the time whether for religious reasons or as a habit, what went wrong in the past few years? How do people view bearded men when they are Muslim? What happens when a society becomes very hostile to men with facial hair? Can you be a hipster with a hipster beard and pass as a hipster, not as a Muslim Brotherhood, and survive in today's Egypt? This is an important perspective on the struggle of bearded men in Egypt who have fallen victims to an extremely harsh Islamphobic campaign after secular army general Abdul Fattah El Sisi took over the country. This feature piece discusses the different experiences of Egyptian young men from various perspectives, some of them have beards for religious reasons, some are affiliated with political Islamic movements, and others are doing it simply for the style, just like how any man anywhere in the world grows a beard. At the end, they all face a similar degree of harassment and discrimination for how they look like. The campaign against Islamic political movements has extended to appearance, and the beard is one of the main targets. Since Egyptian President Abdel Fattah al-Sisi rose to power, officially one year ago but in practice since the armed forces' declaration of 3 July, it was clear that his policy towards Islamic political movements was different from former presidents Hosni Mubarak or Anwar Sadat. Sisi's policy is closer to that of Gamal Abdel Nasser - total and complete obliteration of Islamic movements, with a particular focus on the Muslim Brotherhood. One of the main tools to execute this policy was the use of the media - government-backed media specifically - to terrorise the Islamic political movements which seized the political initiative after the 25 January revolution. The campaign against Islamic political movements was expanded to include a generalised crackdown on Islamic practices and outward Islamic appearance. And nothing symbolised the idea of the Islamic opposition and fear of "terrorism" more than the beard. The media emphasised the idea that bearded men were terrorists, or at least Muslim Brotherhood members. Many lives were affected by this idea and subsequent reprisals that were taken against men who wore beards. Abdullah Farouk Kenibar is a 22-year-old student of medicine at the University of al-Azhar in Cairo. Kenibar is from Kafr al-Shiekh governorate, but he travels to Cairo every year to study. He comes from a religious family that considers the beard as a Sunnah (religiously prescribed practice). His home in Kafr al-Shiekh is near the house of the famous Islamic preacher Abu Ishak al-Houiny, who Kenibar holds in extremely high regard. “In my first year of high school, I used to pray al-Fajr [the morning prayer] regularly at the mosque, and every time I met Sheikh Ishak, he would tell me to grow my beard to be similar to the Prophet Mohammed,” Kenibar explained. He started to grow his beard during his third and fourth years of high school. It was 2011 when Kenibar was enrolled in the Faculty of Medicine at al-Azhar University. Everything was going well for him. Most of the students around him were bearded, and he had no problems interacting with the people of the city. He enjoyed being treated in high esteem on and off the university campus. But things changed three months after Morsi became president. The aggressive tone of the media escalated against Islamists with each passing day. Kenibar and his friends began to feel the growth in animosity from those around them. “I was in the bus going to the university. An old woman carrying a heavy parcel climbed into the bus. I got up from my seat to help her, and she immediately freaked out," Kenibar told MEE. Six months after this incident, Morsi was removed from power, and the Muslim Brotherhood alongside other political Islamic movements called for their adherents to take part in a sit-in demonstration in two main squares. During this sit-in - which lasted for about 40 days - media attacks on Islamists reached unprecedented levels. Along the way to Cairo, Kenibar’s car was stopped by a group of men. Kenibar was attacked violently under the assumption that he was “Ikhwan”, and afterwards he was taken by the gang of men to a police checkpoint, again under the assumption that he was a member of the Brotherhood heading to Cairo to participate in the sit-in. Kenibar was detained briefly for this, and would have stayed in jail if it wasn’t for the interference of his uncle, a judge, who managed to get him out after three days of detention. Ahmed Fouad Hendawy is a 24-year-old photojournalist for Etfarag, an Egyptian news website. He has been working as a photojournalist for five years now, and has worn a beard since he was 18 years old. “I just like the way I look with a beard. I respect those who grow their beard for religious reasons, and I wish I could say that I grew my beard so God would be pleased with me, but it is simple in my case - I just like my appearance as a bearded man,” Hendawy explained. Hendaway’s job requires him to travel all around Egypt. He spends most of his days on the street. Wearing a beard never posed a problem for him. To the contrary, he used to get positive comments about his beard and his hair, which he was growing long as well. But then Hendaway started to face difficulties doing his job. 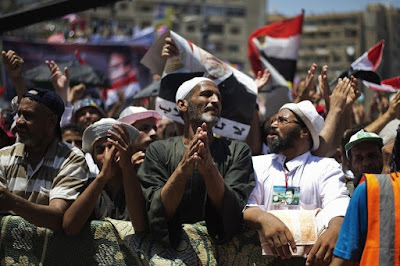 "When Morsi became president, so much negative light was shed on the Brotherhood and the Islamists. Our society is easily influenced and led, and it started to stigmatise all bearded men as Islamists and members of the Brotherhood,” he explained. The breaking point was on the night of 7 July 2013. Hendaway was covering clashes between Morsi supporters and Sisi supporters in downtown Cairo, near Ramses Square. According to Hendaway, after about an hour, police forces intervened in favour of the Sisi supporters. Hendaway was able to capture images of police attacks on Morsi supporters. On his way to the office of the website, he was stopped at a checkpoint. Hendaway was led to a police station where he was detained for about a month, till the efforts of his website were fruitful, and he was released. He is now working extensively on documenting violations police forces carry out against journalists. He has also shaved his beard. Ayman Osama is 26 years old. He currently works as a technical consultant for a multinational corporation in Cairo. 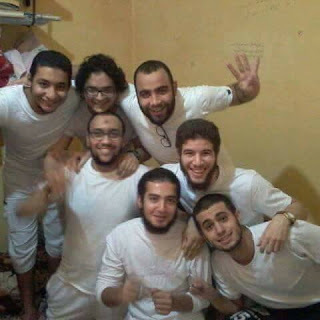 Formerly a student in the faculty of computer science at the University of Ain Shams, Osama used to be a member of a Salafi group. Before he joined the group he was a typical student, who spent his time hanging out with girls and joking around with his friends. After joining the Salafi group, he became more conservative, grew his beard, and became a regular attendant at the mosque on campus. This was noticed by Egypt's National Security apparatus. Osama was shocked by the rudeness of his manager. “I’ve had heated discussions with my colleagues about politics, I knew that most of them were Sisi supporters, but I never thought that I would be treated like that, only for having different ideas, opinions and appearance,” said Osama. Osama got a different job, one that allowed him to grow his beard. But he still shaved it, and says he will remain without a beard until the situation in Egypt gets better. Ibrahim Abdo Ibrahim is 38 years old and a leading member of the Muslim Brotherhood. Abdo experienced detention during Mubarak's rule. “I was detained two times during the days of Mubarak," Ibrahim told MEE. After the events of 3 July 2013, Abdo and all members of the Brotherhood were called to go and participate in the sit-in at Rabaa Square. The calls changed after the raid on the square by police forces. The orders now were for everyone to participate in the processions held by the Brotherhood. In October 2013, security forces raided Abdo’s home. This was expected to happen, because it was known that he was a member of the Brotherhood in his neighbourhood. Fortunately, Abdo was out the night the police raided his house. Since then, he has been a fugitive. His wife took their two children and is staying with her parents. Abdo changes his location every two or three weeks, especially after he was sentenced in absentia for three years in prison for his affiliation with the Brotherhood.